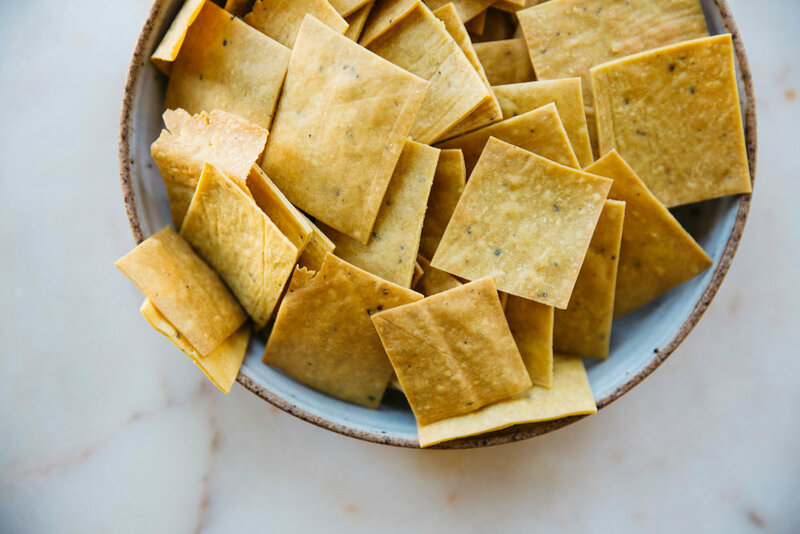 I love this recipe because these crackers only take a few ingredients, come together quickly, and are insanely delicious. Plus, you just can’t beat homemade crackers. The trickiest part is rolling them out. Be sure to roll them out so they’re very thin! (paprika, pepper flakes, herbs would all be great). Sift the chickpea flour into a bowl, add the salt, garlic powder, pepper, and nutritional yeast if using. Add the olive oil and mix with a fork until the dough is crumbly. Add 4 tbsp of hot water and stir until the dough comes together. It’s best to use your hands. If the dough is not sticking together add more water, a teaspoon at a time, until it does. I have found that 5 tbsp is the sweet spot for my own batches. Don’t over think this, the dough should be malleable in your hands and not crack easily, but also should not be too wet that you can’t handle it. Spit the dough into two balls. Place one ball between two sheets of parchment paper, gently pressing the ball into a flatten disc. 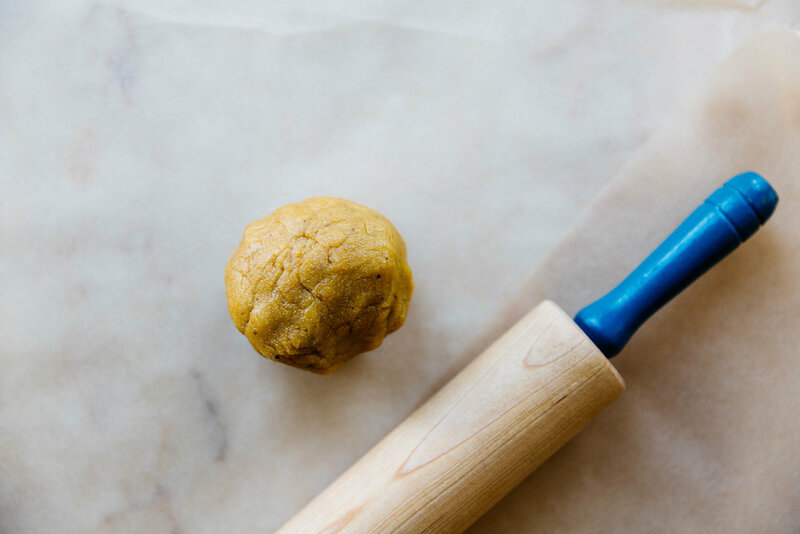 Using a rolling pin, roll out as thin as possible – I cannot emphasize this enough. The thinner the dough, the lighter and crispier your chips will be. Remove the top layer of parchment paper, slide it onto a baking sheet, and score the dough into squares (or whatever shape!). Repeat with the second ball of dough. Bake for 10-12 minutes until the chips are golden around the edges. You may find that the outside crackers bake quicker than the middle, once the outside crackers are golden, remove them and continue baking the rest of the crackers for a few more minutes. These crackers burn easily, so make sure to check every minute after the first 10 minutes. Enjoy with your favorite dip! Store leftovers in an airtight container for up to two weeks.